To get out of custody, the deputy governor will have to pay twice as much as the bribe he supposedly accepted. 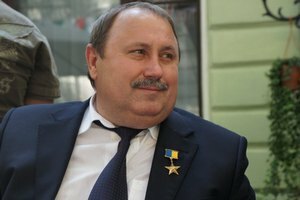 Odesa's Prymorskyy district court on 8 June selected a measure of restraint for the first deputy head of the Mykolayiv regional state administration, Mykola Romanchuk. He was arrested for two months with an alternative of paying the bail of 5.512m hryvnyas (221,000 dollars), according to Novosti-N. Prosecution initially demanded that Romanchuk be kept in custody for two months and granted the bail of at least 14,000 minimum wages (29m hryvnyas). The lawyers of Romanchuk, who was dismissed yesterday, asked the court to place their client under house arrest and wear an ankle monitor without the right of using a phone. Romanchuk and three other officials were detained on 3 June for accepting a bribe of 90,000 dollars. A network of tunnels with a treasure vault was found under his house. Detectives bust second suspected embezzler of "Kyoto money"